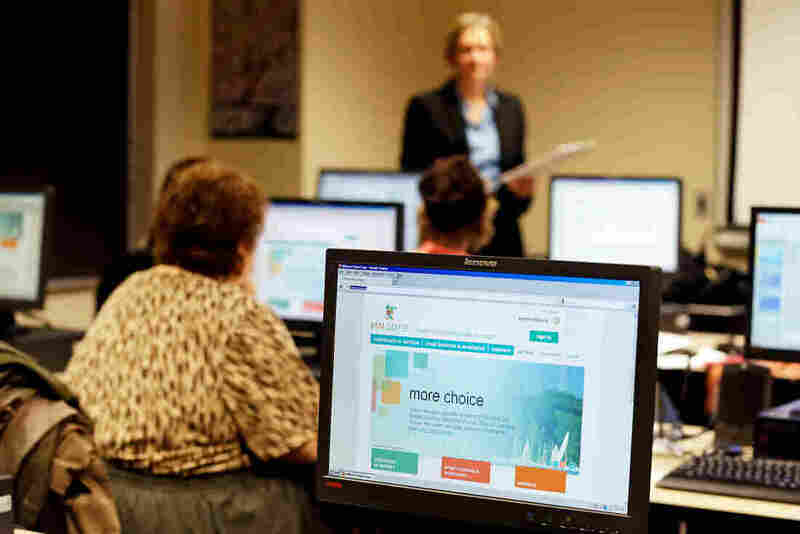 Minnesota Takes Action To Tweak Insurance Market : Shots - Health News The Minnesota Legislature passed a bailout to make coverage under the Affordable Care Act more affordable, rejected an option for bare-bones insurance and is floating a state-sponsored public option. Maureen O'Connell leads an insurance talk in St. Paul, Minn., in 2013 to help attendees understand how the federal health law could affect them. What's going to happen to the federal health law? The quick, accurate answer is that no one knows. But amid the uncertainty about the future of the Affordable Care Act, states still have to manage their insurance markets. Most states have muddled through the 2017 enrollment season without making changes. Minnesota, for its part, took three unusual actions that are worth a closer look. laid the groundwork for a sort of homegrown "public option" insurance plan. In response to some of the highest premium hikes in the country--50 to 67 percent, on average--Minnesota lawmakers passed a bailout for people who earn too much to qualify for the Affordable Care Act's federal tax credit. The $300 million law will cut monthly premiums by 25 percent for about 125,000 Minnesotans. Democratic Gov. Mark Dayton has backed the measure since October, saying the ACA is "no longer affordable to increasing numbers of people." But passage wasn't assured, as both houses of Minnesota's Legislature are controlled by Republicans. The bill passed in January and is supposed to go into effect by April 30, and will be retroactive to the beginning of the year. A failed amendment to the Minnesota legislation sought to strip dozens of so-called essential benefits from health plans, with the expectation that slimmed-down coverage would cost less. Republican Minnesota State Rep. Steve Drazkowski offered the amendment. "What we're doing is trying to create an environment that, if and when the ACA goes away, that Minnesotans will have the freedoms they need in order to start to bring some free-market competition, some free market ingenuity and innovation into the health insurance market," Drazkowski said, adding that he was trying to eliminate the current, "government-controlled, one-size-fits-all, dictating set of mandates." Drazkowski's amendment caught the eye of Minnesota-native and former Centers for Medicare & Medicaid Services administrator Andy Slavitt, who tweeted about it. The list of benefits that consumers could choose to have covered — or not — under Drazkowski's amendment included maternity care, diabetes treatment and mental health care, among others. Some items on the list are very specific: Lyme disease, prostate cancer screening and outpatient surgery. "Telling people, 'Only buy what you need,' implies that people know that they're not going to need the emergency room or that there's not going to be an addiction problem in their family," Slavitt said. "I don't think we, as a country, want people to not have access to the services they need." Dayton and other Democrats opposed the amendment and it was dropped from the final legislation. But Slavitt said it's a cautionary tale about high-deductible catastrophic plans that cover little or no basic care. He doesn't dispute the notion that the individual market needs help, but he says offering extremely limited plans amounts to ill-conceived, "gotcha" insurance. "This is the most blatant one I've seen," Slavitt said, of the failed amendment's approach. But other amendments did make it into the final law, including a provision that changes Minnesota's longstanding state laws requiring HMOs to be not-for-profit. The new law allows out-of-state, for-profit HMOs to sell health plans in Minnesota. Dayton said these measures were not well thought out. "I think it is unnecessary and unwise to rush the reforms added to this bill, without proper public review or full consideration of their consequences," said Dayton. Minnesota is one of a handful of states that offers a so-called basic health plan for some lower-middle class residents. Called MinnesotaCare, the plan provides subsidized health coverage to about 100,000 Minnesotans. Eligibility for a family of four is capped at $49,000 per year. Dayton wants to open the plan to all to all Minnesotans, with higher income residents paying full price for their coverage. "This public option could offer better benefits than any policies presently on commercial markets, more options for people to keep their doctors and clinics and less expensive than what is available today," said Dayton during an announcement of his annual budget plan last week. Dayton says allowing people with higher incomes to buy MinnesotaCare coverage, paying full freight, would reduce prices and increase competition on the individual market. Supporters of the "public option" say it could provide better coverage and cost less because the government could take advantage of its buying power to negotiate better deals with insurance companies. Opponents say expanding government's role in health care is a bad idea. As he campaigned for the presidency, Donald Trump said a public option would drive away private insurers, "leaving Americans with fewer options and eventually no choices but a government-run plan." The one-time bailout is just the beginning of what are expected to be broader health insurance reform efforts in Minnesota. Among them is a renewed call for state-sponsored health insurance that is not expected to be well-received in the state's Republican legislature.